3-1/2 hour smooth float trip down the Colorado River experiencing the thrill of the 1000 ft cliffs of Glenn Canyon. Witness the engineering marvel of the Glen Canyon Dam. Enjoy a short hike and view Indian Pectroglyphs (optional). discretion on sandy and irregular surface. Your Colorado River Rafting Float Tour starts as we pass the towering Ponderosa Pines of Flagstaff. Your Colorado River Rafting Tour will take you past the dormant volcanoes which make up the San Francisco Peaks and through the Navajo Nation. Upon your arrival in Page, Arizona, you'll drive through a spectacular 2-mile tunnel through the cliff walls of Glen Canyon, right to the base of the Glen Canyon Dam. 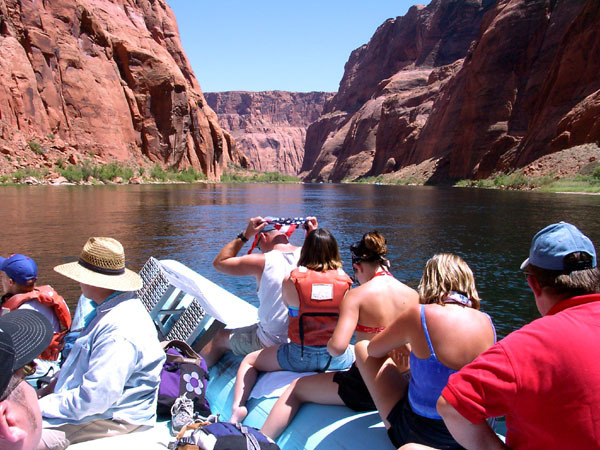 Between Glen Canyons walls that rise over a thousand feet, you float on your raft tour along a gentle stretch of the Colorado River just south of Lake Powell and the mighty Glen Canyon Dam. Sit back and relax as your river guide leads you on a breathtaking journey of colorful rock formations, soaring wild life, ancient Indian petroglyphs, folklore as well as natural and human history. Stop off for an easy hike to get a closer look at the petroglyphs, and enjoy your ''Feast on the Beach'' (a box lunch on the banks of the river). You end your 15.5 mile river journey at Marble Canyon and historic Lees Ferry, complete with cabins of the early settlers. On your return trip, you'll pass by the Echo Cliffs and western edge of the Painted Desert as you re-cross the Navajo Reservation for a stop at the historic Cameron Trading Post. Shop for all sorts of Native American arts and crafts and visit The Gallery, home of many fine and rare pieces of Indian Arts and Crafts. On the Colorado River, you will travel on inflatable, motorized pontoon rafts. Comfortably carrying 22 passengers and piloted by an experienced guide. Lunch will be a Bistro bag lunch consisting of a sandwich, chips, a piece of fruit, a sleeve of mixed nuts. Typically the sandwich is a turkey option but with advance notice we can accommodate a vegetarian choice. The lunch will be enjoyed on the beach of the Colorado River at the well photographed Horseshoe Bend. Make sure you are prepared to spend the day outside. Because weather conditions change throughout the season, check the weather forecast before your arrival. In the spring and fall, we can experience cooler temperatures and windy days, jackets and rain gear may be appropriate. Arizona’s monsoon, or rainy season starts in July and ends in September. Sun protection is a must, so bring a brimmed hat, light weight long-sleeve shirt for protection against the sun, sunscreen, and lip balm. Don’t forget your camera, you’ll definitely want to take lots of photos! Due to water and cameras not mixing well, bring the camera you are comfortable with disposable cameras make an excellent choice. We do provide USCG-approved life jackets, and our guides are trained in water-rescue. While life jackets are optional for adults, wearing a life jacket is mandatory for children, twelve years old and younger, at all times while the boats are underway. Although this is considered a smooth float trip there is only minor splashing and under windier conditions water spray at the front of the boat. There are opportunities to go swimming but the water is under 50 degrees Fahrenheit ALL year around. We will be entering a Homeland Security site in order to get to the launch site, therefore absolutely NO weapons of any kind (i.e. guns, pepper spray, tasers, knives) are allowed. Mild. Light hiking over sandy and irregular surfaces required in order to see the Native American petroglyphs is optional. This is a seasonal tour that operates between late March and October depending on the climate. 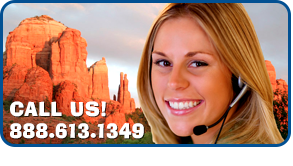 Guest can cancel up to 72 hours before scheduled tour date and departure time and receive a full refund.